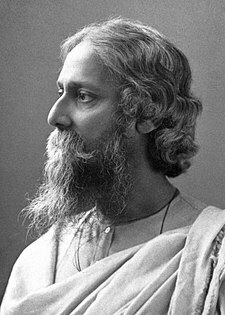 Tagore c. 1915, the year he was knighted by George V. Tagore repudiated his knighthood in protest against the Jallianwala Bagh massacre in 1919. १९२७ तमे वर्षे जुलै १४ दिनाङ्के अनुयायिभ्यां सह ठाकूरः आग्नेय-एशियां प्रति मासचतुष्टयस्य प्रवासम् अकरोत् । तत्र सः बलि, जाव, क्वाललुम्पूर्, मलाक्क, पेनाङ्ग्, सियाम्, सिङ्गापुरञ्च अगच्छत् । 'जात्रि'सङ्कलनं ठाकूरेण लिखितं प्रवासकथनम् । युरोप्-युनैटेड्स्टेट्स्देशयोः प्रवासाय १९३० तमस्य वर्षस्य आदिभागे वङ्गराज्यं पर्यत्यजेत् । तदीयानि वर्णचित्राणि प्यारिस्-लण्डन्नगरयोः यदा प्रदर्श्यमानाः आसन् तदा सः युनैटेड् किङ्ग्डं गतवान् आसीत् । तत्र सः बर्मिङ्घह्यामे सुहृदः गृहे उषितवान् । तत्र सः आक्स्फर्ड्विश्वविद्यालयाय 'हिब्बर्ट् लेक्चर्स्'पुस्तकम् अलिखत् । तत् मानवस्य दैवत्वविषयसम्बद्धः अस्ति । लण्डन्नगरे जाते वार्षिकक्वेकर्कूटे भाषणम् अकरोत् । तत्र ठाकूरः ब्रिटिष्-भारतीययोः सम्बन्धविषयम् अधिकृत्य 'विरहगर्तस्य भयङ्करमुखम्' इत्येतस्मिन् विषये अवदत् । ततः सः तृतीय-अगाखानेन अमिलत् । १९३० तमस्य वर्षस्य जून्मासात् सेप्टेम्बर्मासं यावत् स्विट्सर्लेण्ड्, डेन्मार्क्, जर्मनिदेशेषु प्रावासं समाप्य सोवियत्सङ्घम् अगच्छत् । अन्ते १९२९ तमस्य वर्षस्य एप्रिल्मासे पर्षियन्योगिनः हफेजस्य चरित्रं जानाति इत्यतः इरान्देशस्य रेज् शाह् पह्लवि ठाकूरस्य कृते आतिथ्यम् अयच्छत् । अस्य व्यापकप्रवासस्य कारणतः ठाकूरः हेन्रि बर्ग्सन्, आल्बर्ट् ऐन्स्टीन्, राबर्ट् प्रोस्ट्, थामस् म्यान्, जार्ज् बर्नण्ड् शा, एच् जि वेल्स्, रोमैन् रोलेण्ड् इत्यादिभिः समकालीनैः सह अमिलत् । ठाकूरेण कृतः पर्शिया-इराक्प्रवासः (१९३२), सिलोन्प्रवासः (१९३३) च मानवस्य प्रत्येकताभिलाषः, राष्ट्रियताविषये तदीयान् अभिप्रायान् क दृढम् अकरोत् ? ↑ "Tagore renounced his Knighthood in protest for Jalianwalla Bagh mass killing", The Times of India, Bennett, Coleman & Co. Ltd., 13 April 2011. Retrieved on 17 February 2012. ↑ Datta, Pradip Kumar (2003). "Introduction". Rabindranath Tagore's The Home and the World: A Critical Companion. Orient Longman. p. 2. ISBN 8-1782-4046-7. ↑ Kripalani, Krishna (1971). "Ancestry". Tagore: A Life. Orient Longman. pp. 2–3. ISBN 8-1237-1959-0. ↑ Some Songs and Poems from Rabindranath Tagore. East-West Publications. 1984. p. xii. ISBN 0-8569-2055-X. ↑ Das, S (02 August 2009). Tagore’s Garden of Eden. Retrieved 14 August 2009. "[...] the garden in Panihati where the child Rabindranath along with his family had sought refuge for some time during a dengue epidemic. That was the first time that the 12-year-old poet had ever left his Chitpur home to come face-to-face with nature and greenery in a Bengal village." ↑ Hjärne, H (10 December 1913). The Nobel Prize in Literature 1913:Presentation Speech. The Nobel Foundation. Retrieved 13 August 2009. "Tagore's Gitanjali: Song Offerings (1912), a collection of religious poems, was the one of his works that especially arrested the attention of the selecting critics." ↑ "Tagore, Rabindranath". Banglapedia (Asiatic Society of Bangladesh). Retrieved 13 August 2009. ↑ "Recitation of Tagore's poetry of death". Hindustan Times (Indo-Asian News Service). 2005. ↑ "68th Death Anniversary of Rabindranath Tagore". The Daily Star (Dhaka). 07 August 2009. Retrieved 13 August 2009. ↑ "History of the Tagore Festival". Tagore Festival Committee (University of Illinois at Urbana-Champaign: College of Business). Retrieved 13 August 2009. ↑ Hogan, PC; Pandit, L (2003). Rabindranath Tagore: Universality and Tradition. Fairleigh Dickinson University Press. p. 56–58. ISBN 0-8386-3980-1. Chakravarty, A (1961). A Tagore Reader. Beacon Press. ISBN 0-8070-5971-4. Dutta, K; Robinson, A (1995). Rabindranath Tagore: The Myriad-Minded Man. St. Martin's Press. ISBN 0-312-14030-4. Dutta, K (editor); Robinson, A (editor) (1997). Rabindranath Tagore: An Anthology. St. Martin's Press. ISBN 0-312-16973-6. Frenz, H (editor) (1969). Rabindranath Tagore—Biography. Nobel Foundation. Retrieved 5 April 2006. Meyer, L (2004). "Tagore in The Netherlands". Parabaas. Retrieved 5 April 2006. Radice, W (2003). "Tagore's Poetic Greatness". Parabaas. Retrieved 5 April 2006. Robinson, A. "Rabindranath Tagore". Encyclopædia Britannica. Retrieved 13 August 2009. Roy, BK (1977). Rabindranath Tagore: The Man and His Poetry. Folcroft Library Editions. ISBN 0-8414-7330-7. Sen, A (1997). 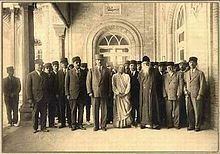 "Tagore and His India". New York Review of Books. Retrieved 13 August 2009. Stewart, T (editor, translator); Twichell, Chase (editor, translator) (2003). Rabindranath Tagore: Lover of God. Copper Canyon Press. ISBN ISBN 1-55659-196-9. Tagore, R (1977). Collected Poems and Plays of Rabindranath Tagore. Macmillan Publishing. ISBN 0-02-615920-1. Thompson, E (1926). Rabindranath Tagore: Poet and Dramatist. Read. ISBN 1-4067-8927-5. Urban, HB (2001). Songs of Ecstasy: Tantric and Devotional Songs from Colonial Bengal. Oxford University Press. ISBN 0-19-513901-1. Brown, G (August 1948). "The Hindu Conspiracy: 1914–1917". The Pacific Historical Review (University of California Press) 17 (3): pp. 299–310. ISSN 0030-8684. Bhattacharjere, S. Rabindra Nattya Dharar Prothem Parjay (in Bengali). Dhaka, Bangladesh: Jtatiya Sahittaya Prokasoni. Chaudhuri, A (2004). The Vintage Book of Modern Indian Literature. Vintage. ISBN 0-375-71300-X. Deutsch, A; Robinson, A (1989). The Art of Rabindranath Tagore. Monthly Review Press. ISBN 0-233-98359-7. Deutsch, A (editor); Robinson, A (editor) (1997). Selected Letters of Rabindranath Tagore. Cambridge University Press. ISBN 0-521-59018-3. Som, Reba (2009). Rabindranath Tagore: The Singer and his Song. New Delhi, India: Penguin Books (Viking). ISBN 9780670082483. http://openlibrary.org/b/OL23720201M/Rabindranath_Tagore. Tagore, R (2000). Gitanjali. Macmillan India Limited. ISBN 0-333-93575-6. Tagore, R. Gitanjali (Song Offerings). "Rabindranath Tagore: Current Articles". Parabaas. Retrieved 15 December 2007. "Sadhana: The Realisation of Life". LibriVox. Retrieved 5 August 2009. "Rabindranath Tagore". Calcutta Web. Retrieved 15 December 2007. "Tagore and his India". Nobel Foundation. Retrieved 15 December 2007. "Rabindranath Tagore: The Founder". Visva-Bharati (Shantiniketan). Retrieved 15 December 2007. "Rabindranath Tagore's Conversation with Albert Einstein". School of Wisdom. Retrieved 15 December 2007. "Rabindranath Tagore: In Conversation with H. G. Wells". School of Wisdom. Retrieved 15 December 2007. "Sadhana: The Realisation of Life". at Scribd. Retrieved 21 September 2009. "রবীন্দ্রনাথের বিভিন্ন রচনা". Ankur. Retrieved 15 December 2007. "The Works of Rabindranath Tagore". Internet Sacred Text Archive. Retrieved 15 December 2007. "Gitanjali (Song Offerings)". at Scribd. Retrieved 5 August 2009.